The information in this book will help bearing engineers make real-life improvements to the capacity and operational reliability of bearings in vehicles, machines, equipment and plants, saving on both time and costs. This book is an essential reference to the fundamental correlations of bearing engineering, and to all aspects of bearing design and technology. Johannes Brändlein is the author of Ball and Roller Bearings: Theory, Design and Application, 3rd Edition, published by Wiley. Paul Eschmann is the author of Ball and Roller Bearings: Theory, Design and Application, 3rd Edition, published by Wiley. Ludwig Hasbargen is the author of Ball and Roller Bearings: Theory, Design and Application, 3rd Edition, published by Wiley. 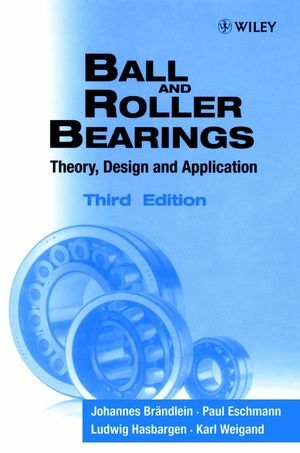 Karl Weigand is the author of Ball and Roller Bearings: Theory, Design and Application, 3rd Edition, published by Wiley. Load Carrying Capacity and Service Life. Examples of Calculation and Design of Roller Bearing Arrangements.